With equity indexes unravelling, the VIX battled higher across the day, and into the monthly close, settling +8.7% @ 14.55 (intra high 15.29). 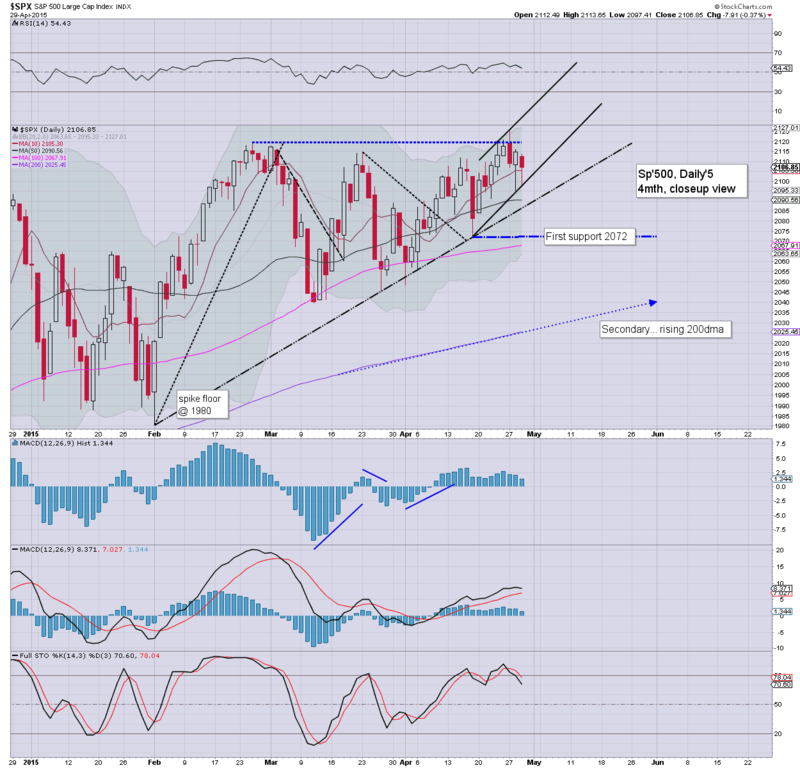 With the sp'500 unable to hold the 50dma.. near term outlook is moderately bearish.. at least to the 2075/70 zone. 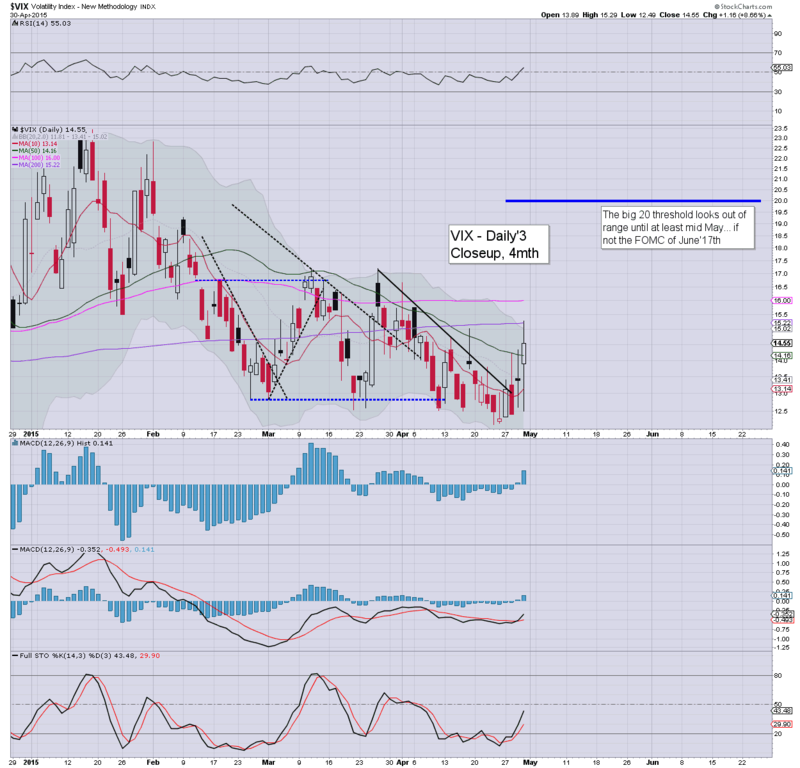 Suffice to say.. despite sig' net daily declines for all equity indexes, the VIX remains at relatively low levels. 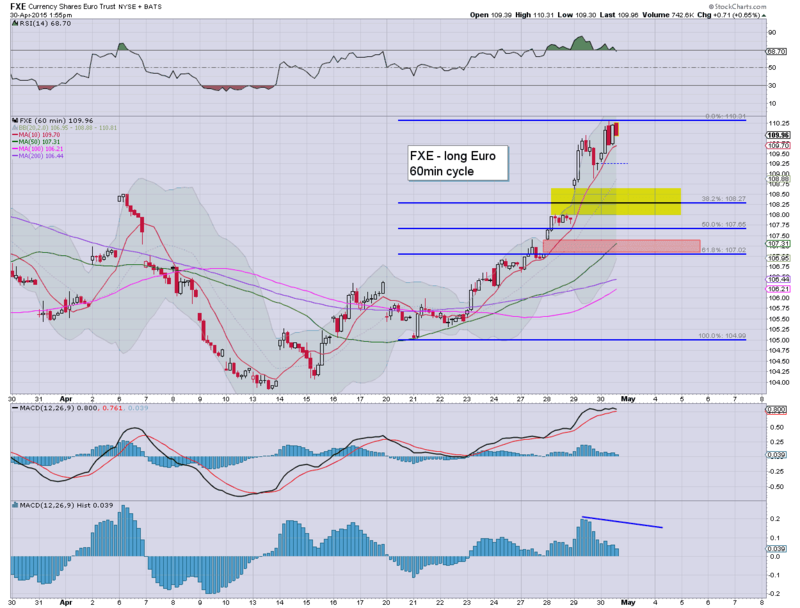 The big 20 threshold still looks out of range in the immediate term. US equity indexes closed significantly lower, sp -21pts @ 2085 (intra low 2077). The two leaders - Trans/R2K, settled lower by -1.2% and -2.1% respectively. 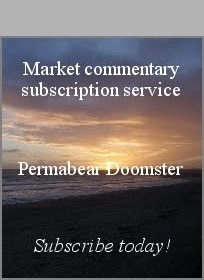 With April ending on a dour note, near term outlook is moderately bearish. 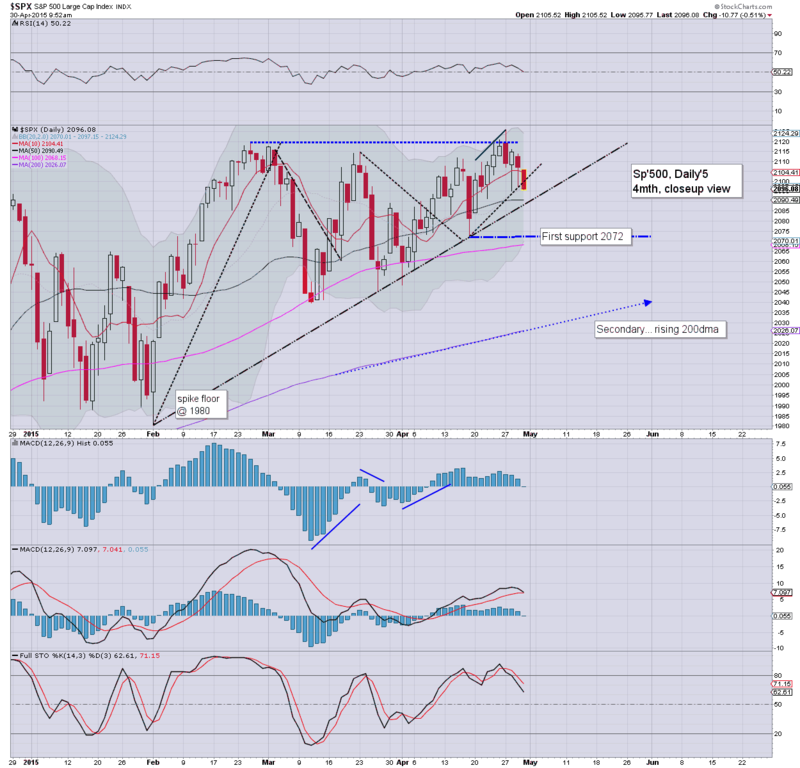 It is highly notable that core rising support for the sp'500 will be around 2025 in May. ... and that is one third of the trading year now complete. Clearly, a day for the bears across all indexes. 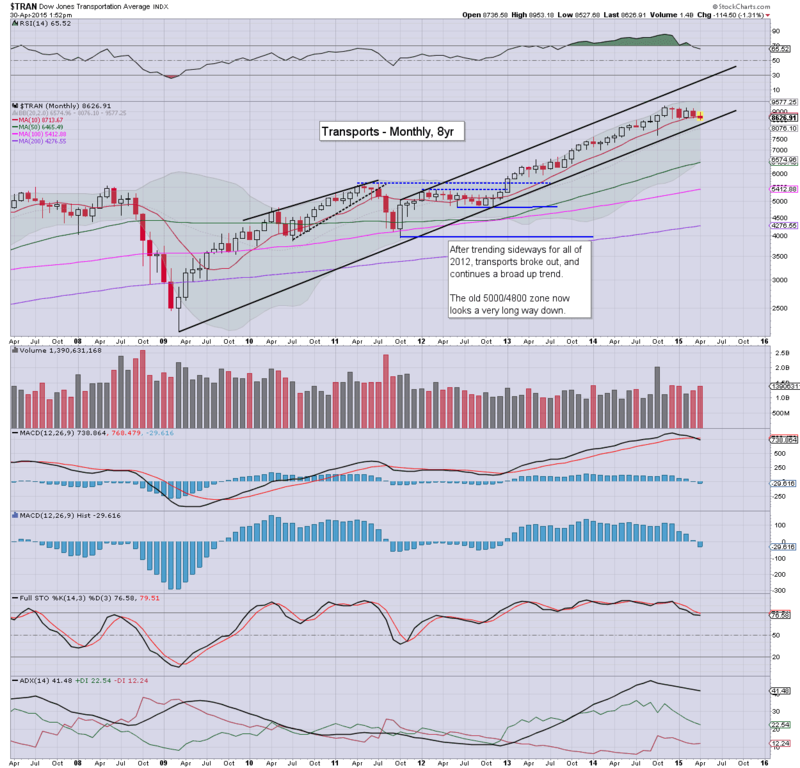 *I will cover the monthly indexes more later, but for now, suffice to say... Trans/R2K saw a sig' net monthly decline, whilst the sp'/dow/nas/NYSE comp' both managed moderate gains. I remain on the sidelines... eyes on long Euro and Oil... but with the markets as they are... I'm starting to wonder about China... which is offering a rollover.. back to 4K. US equities continue to unravel (if slowly).. unable to hold the earlier low at the 50dma, with the sp'500 currently -20pts @ 2086. Next support is 2075/70.. with the 2072 low of April 17'th. Metals remain weak, Gold -$19. With the USD unable to rally, Oil has built sig' gains of 1.4% into the $59s. 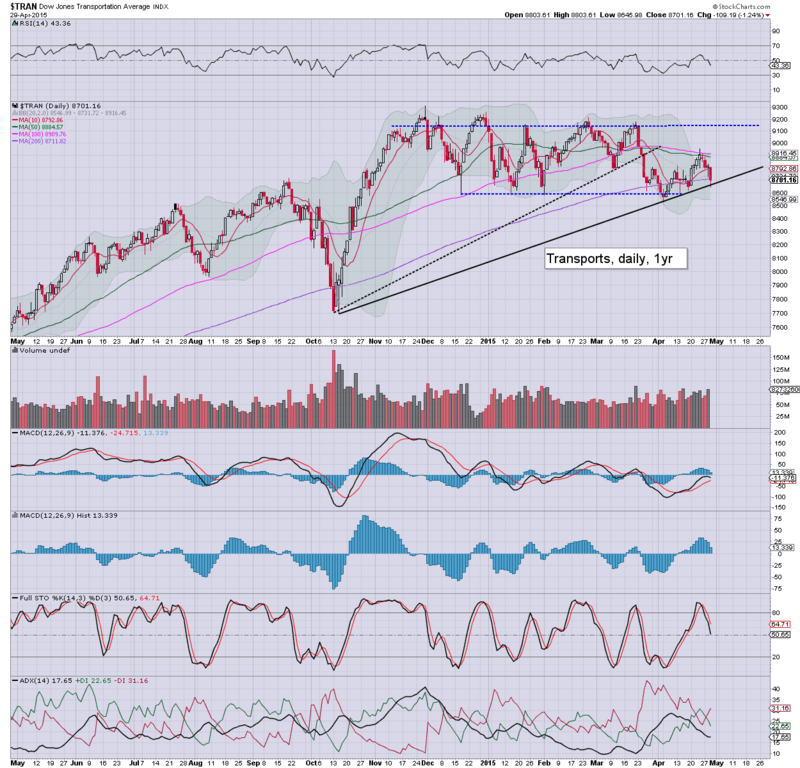 *the second market leader - R2K, looks especially nasty... and is followed by the Trans... both net lower for the month. 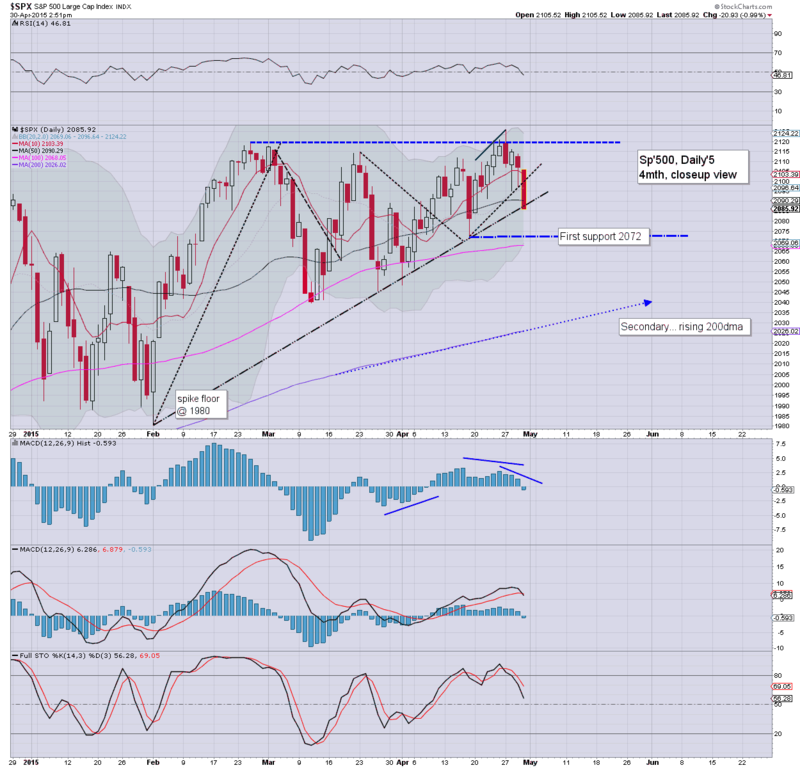 So.. we have the R2K/Trans.. leading the way lower, and now the sp'500/Dow are both holding under their 50dma's. 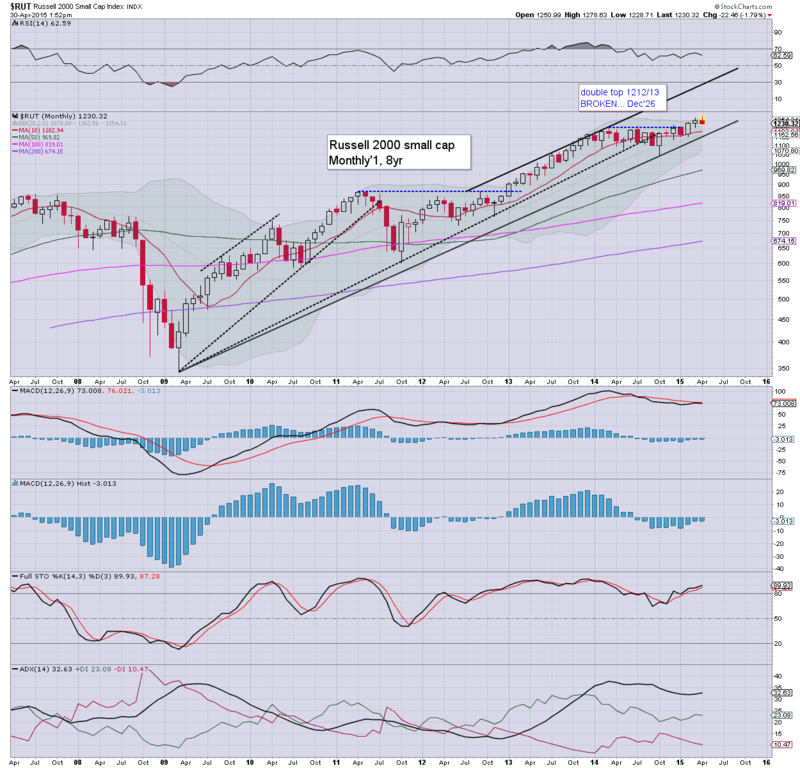 ... not exactly the most bullish of monthly closes, but still... new highs were hit for a number of indexes, and earnings broadly came in 'reasonable'. 3.04pm.. The rats are getting real twitchy... with empty air to 2075/70. Things really only get interesting if <2070... along with VIX 20s... but right now.. the latter looks especially difficult to hit. *core support for May will be 2025... and certainly the giant 2K threshold. Whilst the broader market remains only moderately lower, there is notable sig' weakness in the two leaders - Trans/R2K, both on the daily and giant monthly cycle. A significant net monthly decline is somewhat suggestive of a problem in the months ahead. *I thought a little side track into the bigger picture would be kinda interesting for this hour. A notable 4 months lower of the past 6 for the 'old leader'. With the two leaders set to close April net lower (all other indexes are set for net gains of around 1%), there is a hint of a viable sig' down wave this summer. 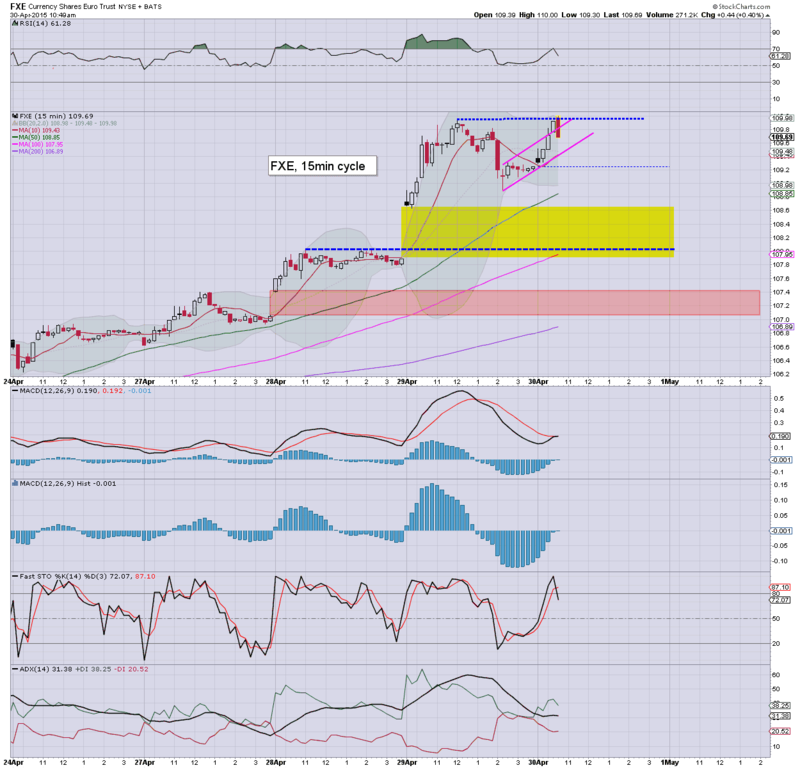 I continue to have eyes on FXE... as a long, however.. not at this price... nor time. Looks like I'll have to wait until next Monday.. when we might see the 108s.. that would be an acceptable level.. at least to me! 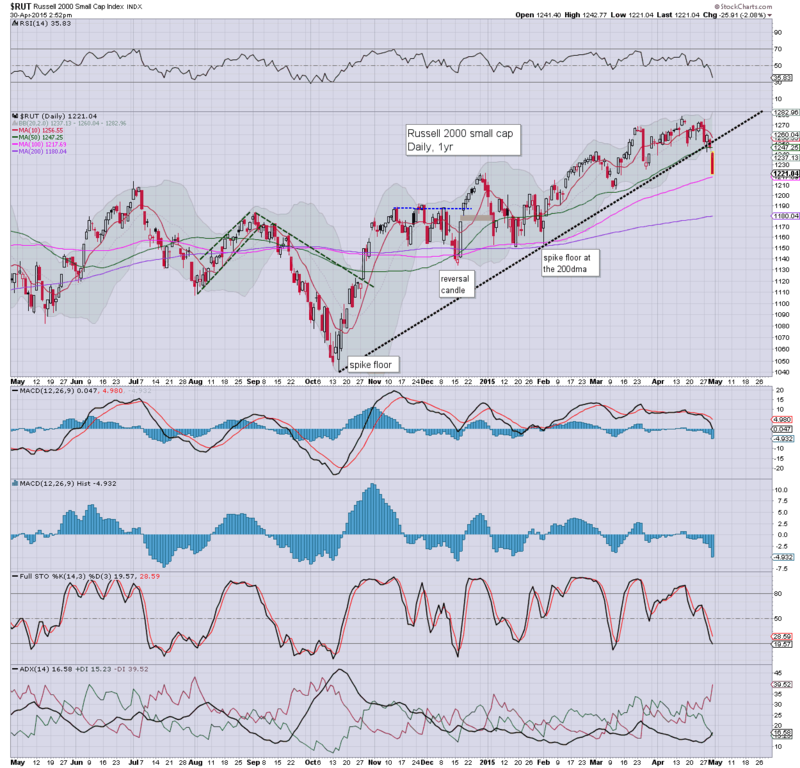 US equities have got stuck at sp'2102.. with renewed downside to 2093. A break under 2090 will open up at the 2075/70 zone by the Friday close. Metals remain exceptionally weak, Gold -$21, with Silver -2.9%. Oil is holding borderline sig' gains of 0.9%. 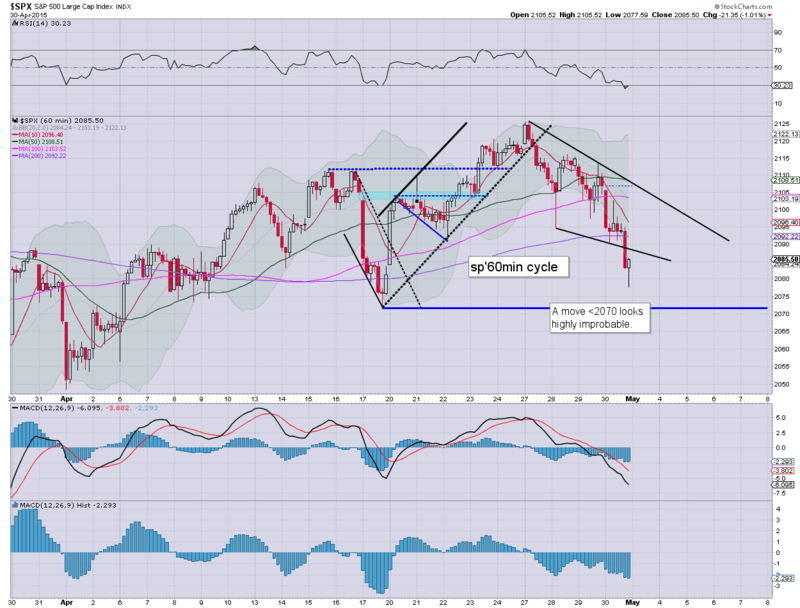 *note the lower bol' on the daily cycle.. along with the key low of 2072. If 2090 fails.. then we'll likely fall into the close. Eyes on the VIX.. which is on the edge of breaking a new intra high (>14.53). 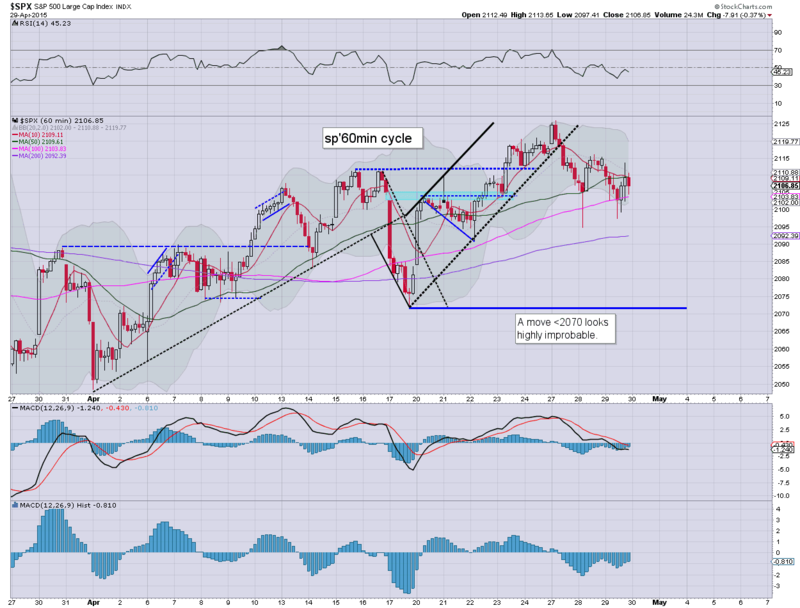 Daily cycle is offering the 15.00 threshold by the close. notable weakness: AAPL -2.6% in the $125s... next sig' support is around $122/20.... and with the trend as it is, it would be indirectly supportive of sp'2070s. As for what I'm doing, well, I don't like much of anything at these levels.. least of all... Oil.. or the Euro. 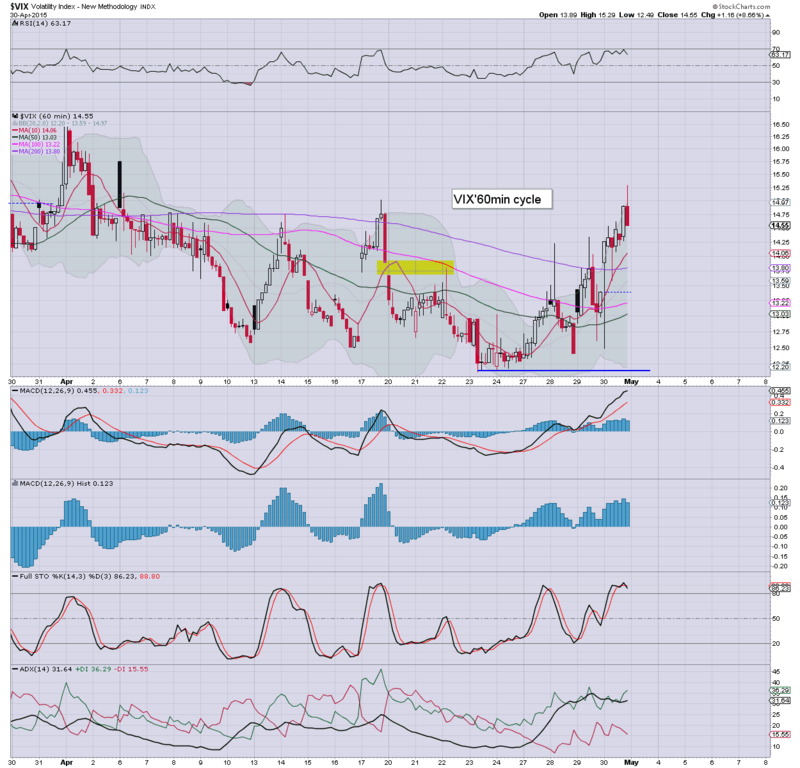 *VIX breaks the morning high.... with sp'2091... looks like the 50dma will not be held. 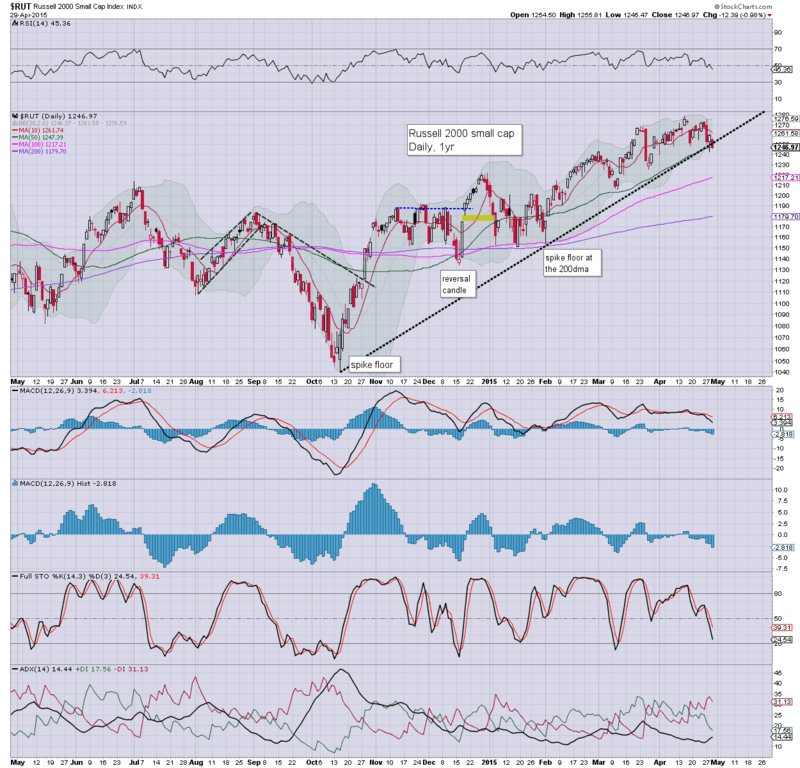 US equities have seen a natural turn around 11am, with the sp' already having swung from the 50dma of 2090 to 2102. A daily/monthly close in the 2110s remains very viable... along with what remains a subdued VIX in the 13s. Metals remain weak, Gold -$23. Oil is building moderate gains of 0.8%. *I continue to have eyes on FXE.. having battle beyond where I was looking.. finally, it might be in cooling mode... into early May. Not much to add... on what is likely just another day of moderate weakness.... only to conclude with latter day strength. 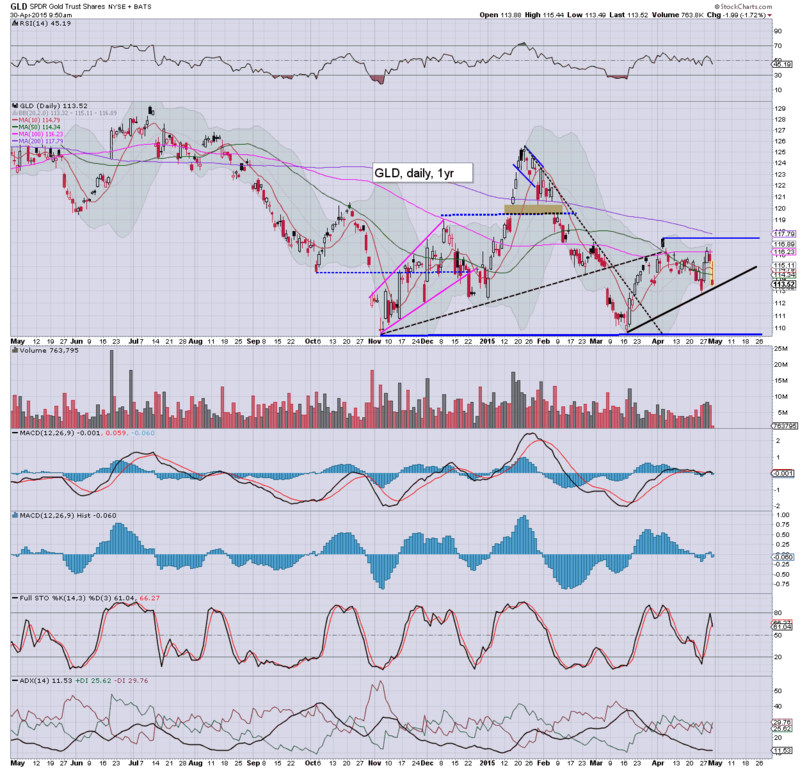 notable weakness: miners, GDX -2.7%.. as the metals end the month.. net lower. US equities have completed an effective test of the 50dma of sp'2090. 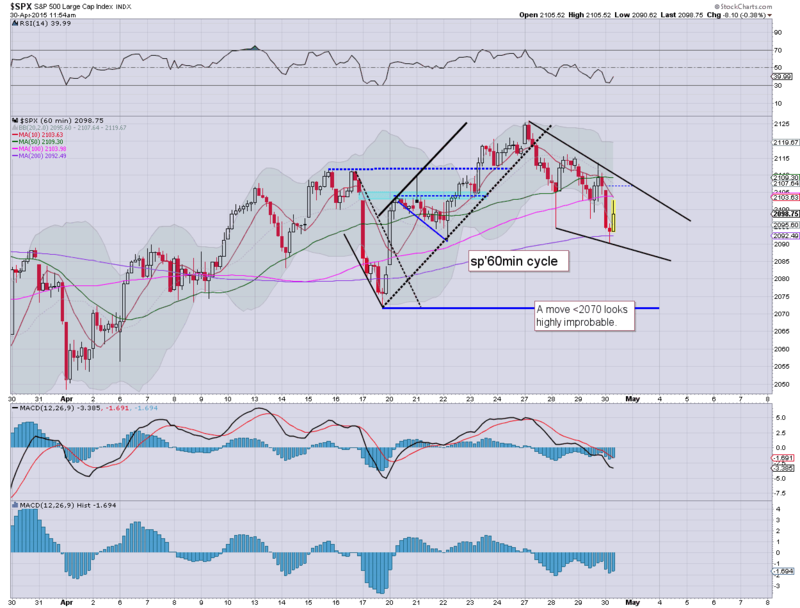 A latter day recovery looks probable. Metals remain extremely weak, Gold -$22, with Silver -3.5%. Oil is battling to hold moderate gains, +0.2% . So, a hit of the 50dma... but having taken out the Tuesday low of 2094. Overall though, its probably the same old nonsense of early moderate weakness... only to conclude with a latter day recovery. I have eyes on the Euro... via FXE, which appears have put in a micro double top. I've little interest in going long until the first gap zone.... seems viable late today... or early tomorrow. Meanwhile... equity indexes are seeing the expected upswing. VIX looks maxed out at 14.53.... which is of course still a bizarrely low VIX. 11.32am... Not even lunch time and the indexes are getting close to turn green.. .. with sp'2102. Equity indexes open moderately lower, but as ever... there is the threat of a latter day recovery. There is notable weakness in the precious metals, Gold -$20, with Silver -4.0%. Oil is a touch higher, but looks vulnerable. *price structure for the metals remains a bearish H/S formation, offering the giant $1000 threshold for Gold this summer. Weakness all the way into the weekend? 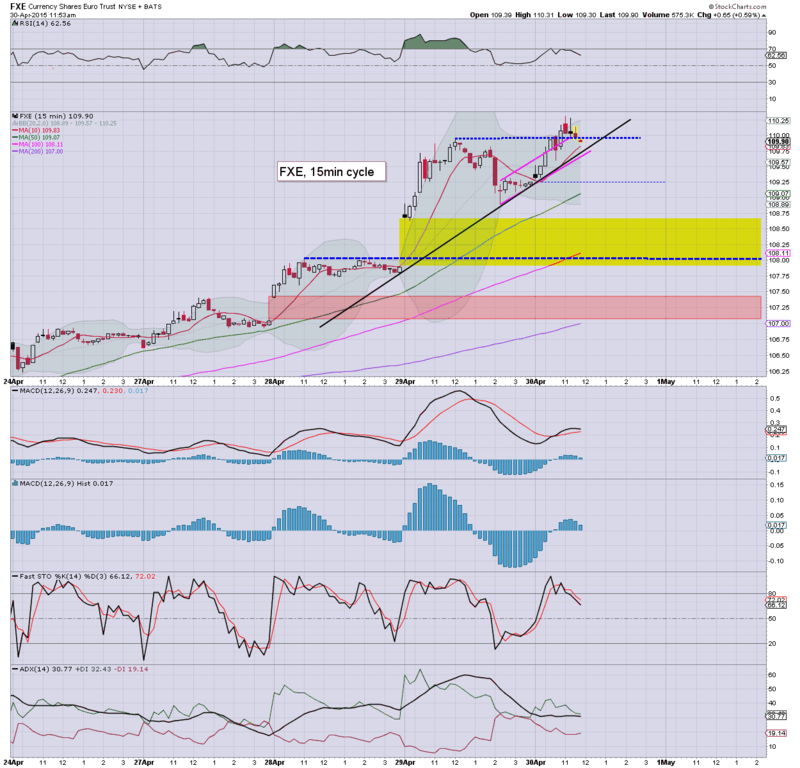 notable weakness, AAPL -1.4% in the $126s... not looking so pretty. 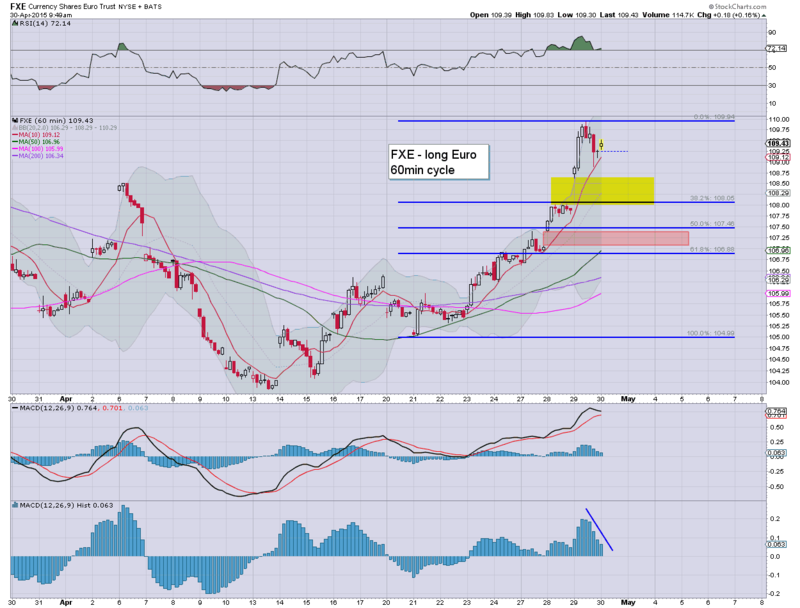 I have eyes on USO and FXE... as viable long trades across the first half of May. Seeking an entry in the 108.70/50s. which seems viable today. The secondary lower (red) target is probably out of range. 10.37am.. so far... holding the 50dma of sp'2090. Time is probably running out for the bears.. typical turn will be 11am... as ever. VIX is already looking spiky in the mid 14s. 10.42am.. micro double top on the Euro.... USD set to rally... at least moderately today. Good morning. Futures are a little lower, sp -4pts, we're set to open at 2102. A break below the Tuesday low of 2094 looks unlikely. The sp' is set for a net monthly gain of around 2%. 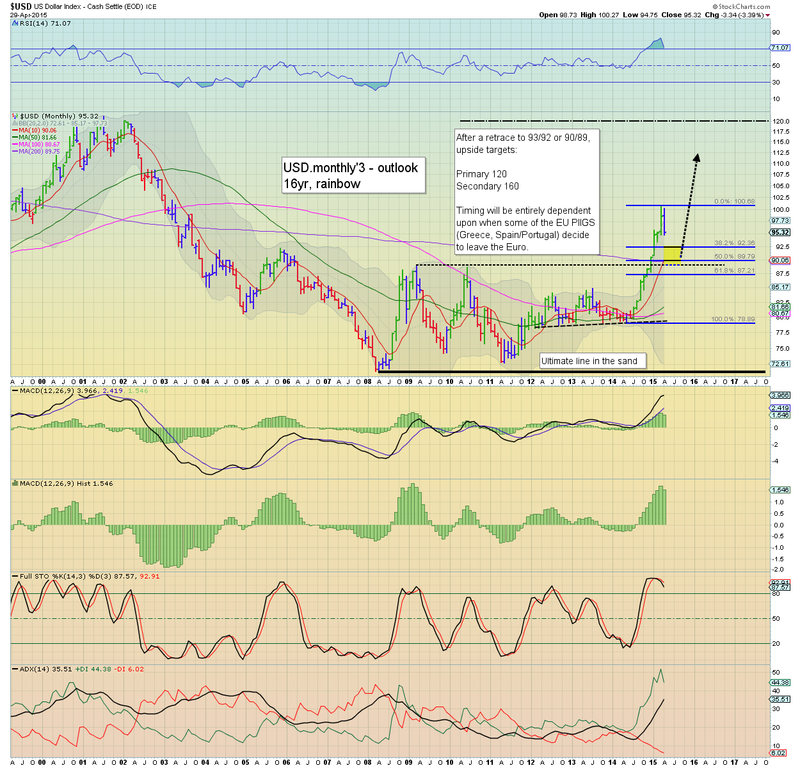 Metals are a touch higher, Gold +$2. Oil has early gains of 1.0%. Again its a case of early weakness, but there will be high chance of a latter day rally.. with a net daily gain... settling the month in the sp'2110s.. or even 2120s. It is end month of course, and so expect some increasing price action this afternoon. USD remains cooling, -0.4% in the DXY 94.70s... pretty incredible really. It does look that if the down cycle continues into June, we'll be pretty close to the secondary target zone of 90/89. 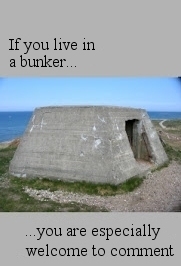 From there... I think the trade becomes somewhat easier.... and that probably includes oil (short-side from 67/75). *I was looking to go long Euro and/or long Oil this morning... however, the opening gains in both are something I am not going to chase. notable strength: TWTR +1.4%.. but its surely a dead cat bounce... still looks headed for 36/34 zone before a real chance of levelling out. Good wishes for end April trading! A much better level, but 52 is not exactly super bullish economy. *notable weakness, metals. Gold -$19... end month washout! Whilst US equity indexes saw some moderate weakness, it was just another day for the USD, falling for the sixth consecutive day, settling -0.9% @ 95.32 (intra low 94.68). The first target zone of 93/92 is within easy range by mid May.. and increasingly, the 90/89s look possible in June. Little to add from recent days. 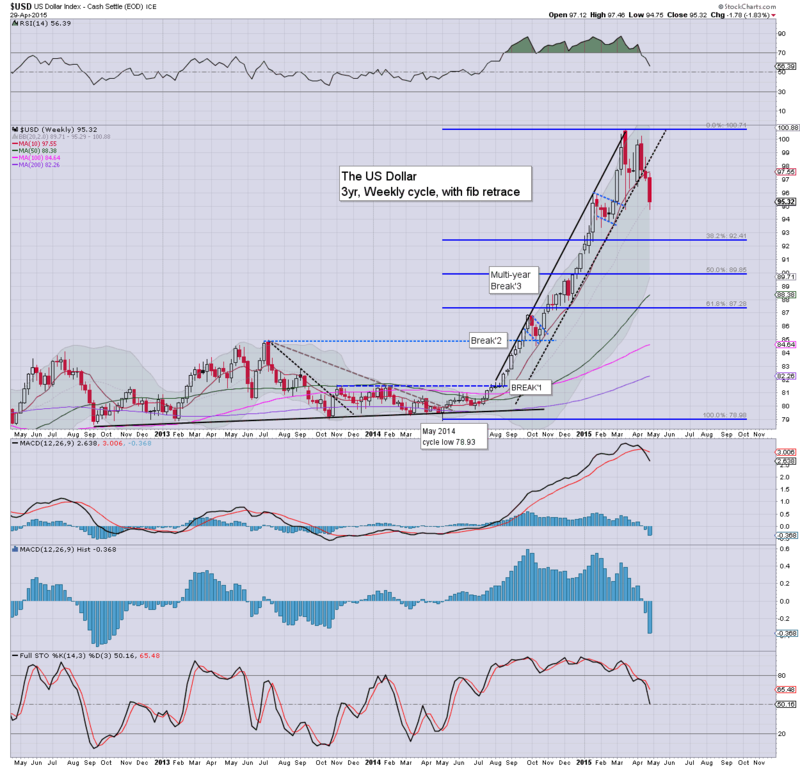 USD continues to cool from the recent high of DXY 100.71.... with the Euro continuing to rebound. Thursday will see the usual weekly jobs data, pers' income/outlays. Most notable, the Chicago PMI, Mr Market is expecting 50.0 against the previous 46.3. Another number under the recessionary threshold of 50 would be a problem for the macro-econ bulls. Chatter from Riley and Heffernan... flash crash, closing of futures pits, and other stuff! It has been a useful few weeks for yours truly. I am staying clear of meddling in the main indexes (and especially the VIX) Instead, I'm focusing on currencies, Oil, and a few individual companies for earnings. Next trade... seeking to go long Euro - via FXE, and perhaps pick up Oil-long again.... which looks set to break into the $60s. Certainly, I remain concerned that equities will rally upward into mid June.. and right now, the USD is currently in sync with such an equity/Oil cycle peak this summer. A major retrace in late Q3 or Q4 still seems possible. For now though, I sure ain't shorting the main market. US equities closed weak, sp -7pts @ 2106 (intra low 2097). The two leaders - Trans/R2K, settled lower by -1.2% and -1.0% respectively. Near term outlook offers a little further downside, but the broader trend remains bullish.. perhaps all the way into mid June. *notably, the two leaders - Trans/R2K, have both marginally broken the broader upward trend that stretches back to last October. 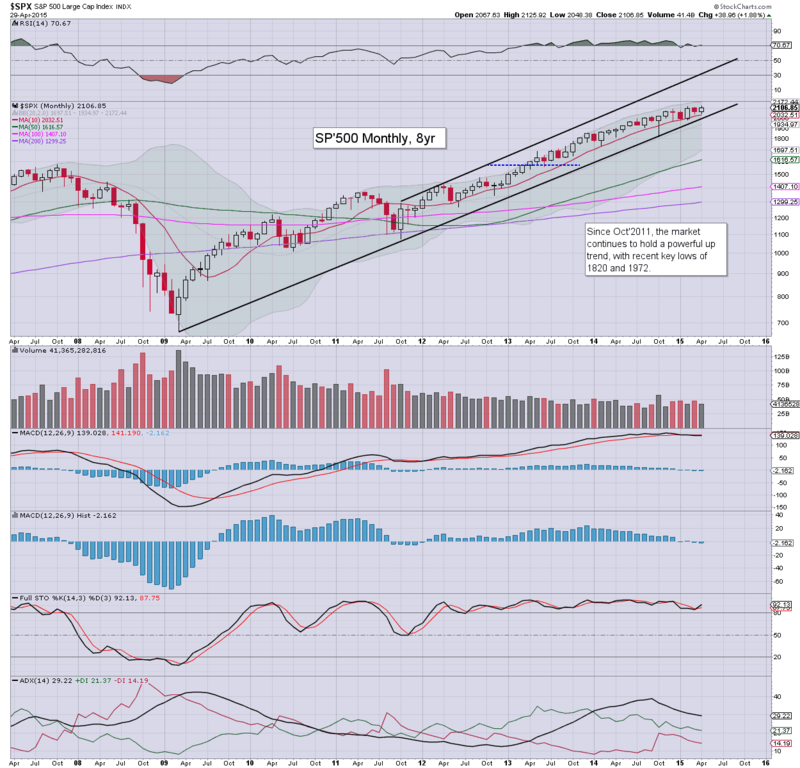 For the sp'500, it was a near perfect hit of soft rising trend... new historic highs look due... and its even possible we'll see a weekly close in the 2130s.